ww2dbaseYoshijiro Umezu graduated from the Japanese Army Academy in 1903 and the Army Staff College in 1911. In the 1910s, he was sent to Germany and Denmark to study military science. When WW1 broke out, he became a military observer in Denmark. Between 1919 and 1921, he served as the military attaché to Switzerland. Between 1923 and 1924, he served as an instructor at the Army Staff College. Between 1924 and 1926, he was the commanding officer of 3rd Infantry Regiment. He was promoted to the rank of major general in 1930 and lieutenant general in 1934. Between 1934 and 1935, he was the commanding officer of the China Garrison Army. Between 1935 and 1936, he commanded the 2nd Division. In 1936, he was recalled back to Japan to serve as the Vice Minister of War for the next two years. In 1938, he returned to the Second Sino-Japanese War as the commanding officer of 1st Army. In 1939, he was made the commanding officer of the Kwangtung Army. In 1940, he was made a full general. In Jul 1944, he stepped down from his position with the Kwangtung Army as he was made the Chief of the Imperial Japanese Army General Staff and a member of the Supreme War Council. In this capacity, he made recommendations against surrendering in the final days of the war, believing that the Americans would be willing to negotiate for peace if the Japanese could inflict serious casualties against the impending invasion. He was aware of the planned coup d'état by radical junior officers, and decided to do nothing to hinder it. When ordered by Emperor Showa to sign the surrender document, although it was against his recommendation, he obeyed the instructions given to him. 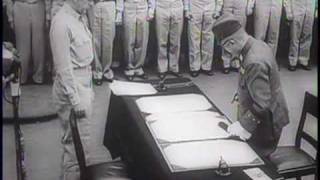 He signed the instrument of surrender aboard USS Missouri in Tokyo Bay, Japan on 2 Sep 1945, representing the Japanese military. After the war, he was tried and found guilty of waging a war of aggression and was given a life sentence. He died from rectal cancer while in captivity in 1949. 4 Jan 1882 Yoshijiro Umezu was born in Nakatsu, Oita Prefecture, Japan. 30 Nov 1903 Yoshijiro Umezu graduated from the 15th class of the Japanese Army Academy. 12 Feb 1904 Yoshijiro Umezu was promoted to the rank of second lieutenant. 30 Jun 1905 Yoshijiro Umezu was promoted to the rank of lieutenant. 25 Mar 1912 Yoshijiro Umezu was promoted to the rank of captain. 1 Jun 1918 Yoshijiro Umezu was promoted to the rank of major. 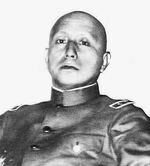 8 Feb 1922 Yoshijiro Umezu was promoted to the rank of lieutenant colonel. 15 Dec 1925 Yoshijiro Umezu was promoted to the rank of colonel. 1 Aug 1930 Yoshijiro Umezu was promoted to the rank of major general. 1 Aug 1934 Yoshijiro Umezu was promoted to the rank of lieutenant general. 7 Sep 1939 General Yoshijiro Umezu succeeded General Kenkichi Ueda as the Governor-General of Kwantung Leased Territory in northeastern China. Jo Iimura was named Umezu's chief of staff. 1 Aug 1940 Yoshijiro Umezu was promoted to the rank of general. 26 Mar 1945 Yoshijiro Umezu rejected the proposal to deliver biological weapons by submarine-borne aircraft on a city on the west coast of the United States due to ethical reasons. Without army support, Operation PX would soon be canceled. 30 Nov 1945 Yoshijiro Umezu was placed on the reserve list. 12 Nov 1948 Yoshijiro Umezu was found guilty of waging a war of aggression and was given a life sentence. 8 Jan 1949 Yoshijiro Umezu passed away from rectal cancer while in imprisonment in Tokyo, Japan.